When we talk about a dashcam under $100, it is usually equipped with basic features packed and parcel in a substandard exoskeleton. Papago’s GoSafe 118, though, throws that misconception straight out of the window. 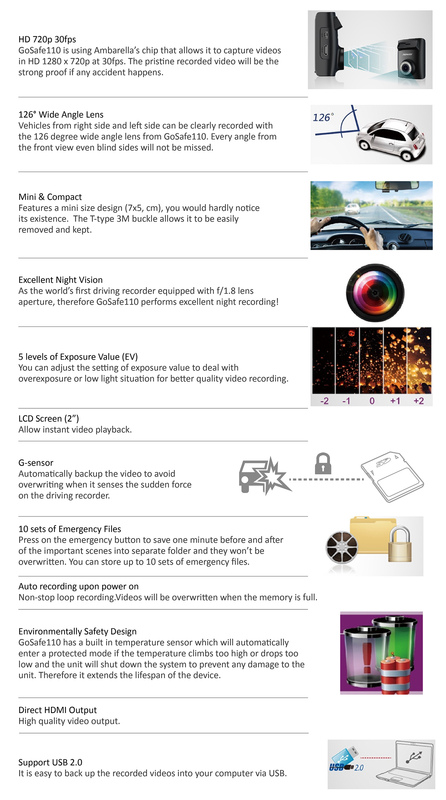 While these features form a part of the conventional dashcam, what makes Papago 118 truly special is the added safety features packaged within. The 118 has a nifty “Driver Fatigue Alert” system that allows you to set timers to remind the driver to rest after a certain amount of hours on the road. The “Stop and Go Alert” keeps an eye out for you and beeps when the driver in front of you has moved. The feature only activates if you’re stationary for more than 10 seconds, allowing you to have a distraction-free driving experience. If this wasn’t enough, the 118’s “Headlight Reminder” system beeps and flashes whenever poor lighting condition strikes, notifying you to turn on the headlights and drive in a safer method. Yet another vital alert system the 118 offers that turns the dashcam into a surveillance system is the “Motion Detection” feature. The 118 runs on low battery consumption in your absence (when plugged in to an "always on" outlet in your vehicle, some vehicles may not have this capability) and activates every time it detects a motion in front of the vehicle, turning it into an optimal security system for your car. When was the last time your dashcam was also a watchful and vigilant co-passenger? If you are keen on tracking your speed and location via GPS, the 118 also offers a GPS antenna input where an optional GPS antenna can be easily installed. The Papago 118 itself is powered by hooking up to the car’s internal battery system, allowing it to work flawlessly without the need to change its battery on a regular basis. A replacement and upgrade from the GoSafe 110, Papago's new GoSafe 118 proves that size does not matter when it comes to dashcams. This micro-sized dashcam records in high quality 720p video resolution with a 125° viewing angle, taking up very little space on your car’s windshield. If it is supplied power continuously (by being hard-wired or from a car’s "always hot" cigarette lighter outlet, then you can take advantage of the motion detection feature and protect your vehicle from any mishaps during your absence. A Micro SD memory card (8, 16, or 32gb - Class 6 or higher) is required for use with the GoSafe 118. The memory card is not included but is available for purchase above or on our memory cards page. Save money and ensure optimal performance with our "Dash Cam and Memory Card Combo" by selecting a high quality card with the GoSafe 118 above! This car DVR includes FREE standard ground shipping within the continental United States. Expedited shipping may be selected during checkout for an additional fee. International shipping is also available on this item. A simple to use, easy, reliable, basic dashcam! High quality product from well known vehicle recorder company PAPAGO! GPS-ready, add a GPS antenna later if you desire! The Papago GoSafe 118 is a ridiculously cheap dashcam given that it offers everything a driver would want, and more! Right from its Driver Fatigue Alert system to the Headlight Reminder feature, the GoSafe 118 is crafted keeping the driver’s safety in mind.